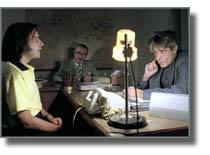 A film-student working on her diploma-film meets with Cristi Sãndulescu, who was wrongfully convicted of the brutal murder of a young woman. The police – eager to bring the case to a close – knowingly arrested the wrong man. Under the pressure of physical and psychological torture, Cristi’s wife and friends begin to believe in his guilt and make statements to that effect; even Cristi finally confesses. Five years later, the real killer is caught – a psychopath who even brags about the murders he committed. 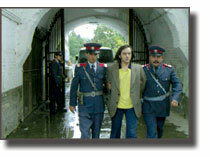 Cristi Sãndulescu is set free. Through flashbacks, the film shows us how the life of a carefree man was totally and utterly destroyed. At first, Cristi seeks revenge, but learns all too soon that it will not change his situation nor bring him peace of mind. Everybody blames the system and points to Ceausescu, who is said to have given the orders personally. In Romania, the film started a discussion about the country’s totalitarian past and its consequences for present society. It implies that people do not learn from history, because only personal experience allows them to understand. This gap between the generations is a leitmotiv of the film: Cristi’s father was a political prisoner, a fact that does not interest his son until his own life takes a similar turn. When he finally gets out of jail and tries to teach his kids about political symbolism, his wife meets him with an utter lack of comprehension. Even his interview-partner shows little compassion and – towards the end – a complete lack of interest. Who today wants to hear about the old socialist past, anyway?